Amoebiasis is a parasitic disease that affects humans alone and which, especially in its most typical form, is a dysentery. Very widely spread in the world, particularly in the tropics, it is due to a unicellular parasite, dysenteric amoeba. When the Colonial Health Service is inaugurated, the agent responsible for amoebiasis has already been discovered and the clinical presentation of the disease described by scientists of different nationalities for, at that time, amoebiasis is a world-wide phenomenon. 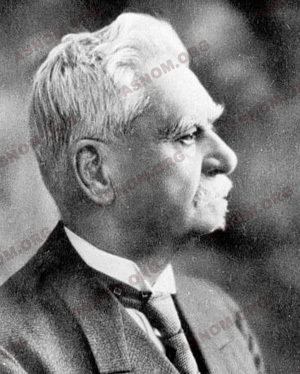 Two French colonial physicians distinguish themselves particularly in research on this disease : Marchoux*, from 1899, in the study of the parasite and, later, F. Blanc* in clinical work and treatment. Nowadays, it still remains an endemic of paramount importance, for it affects hundreds of millions of individuals in the world. There is no specific means of combat that protects against it. On the other hand, a better knowledge of the biology of the amoeba leads to a better understanding of the epidemiology and, especially, the capacity to install protective measures. This endemic is treated by the polyvalent medical establishments of the AMI, dispensaries and hospitals, which have two tasks to perform : treating the numerous cases detected daily in consultation and assuring prevention by recommending hygienic measures, for amoebiasis is a disease caused by contact with faeces. Therapy has progressed considerably with the advent of extremely efficacious medicines. Individual and collective prophylaxis has remained a constant preoccupation of the Colonial Health Service but it depends, for what is most important, on services other than that of health. In 1875 in Saint Petersburg, Losch describes, for the first time, an amoeba containing remains of red blood cells in the human organism but it is Koch and Kartulis who establish its pathogenic role in humans. 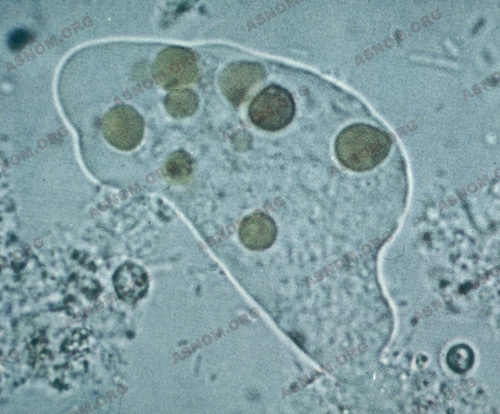 Amoebae are present in the bloodstained faeces of dysentery patients with colic ulcerations ; but amoebae may also be found in healthy people without digestive troubles. In 1899, at St Louis in Senegal, Marchoux*, a student of Pasteur, demonstrates experimentally that there exists only a single species of pathogenic amoebae. 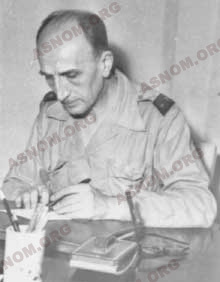 In Indochina, a territory particularly affected by amoebiasis, the physicians of the Colonial Health Service participate in research. Mathis* in Hanoi (1907) and Noc* in Saigon (1909) describe the morphology and the cycle of evolution of the dysenteric amoeba. This phenomenon is elucidated only in 1911. The parasite appears in two forms in the colon : either in an aggressive form (histolytica) which is mobile and avid for red blood cells or a harmless variant (minuta), living on the surface of the mucus and likely to form cysts. Amoebic cysts are eliminated with the faeces and pollute the environment. Unlike the aggressive amoeba, the cyst can survive for many days and assure the dissemination of the parasite. The minuta form and the cysts living silently on the intestinal mucus correspond to "amoebiasis infection". Symptoms are absent : the patient experiences no difficulty, he is called a "healthy carrier" but is dangerous for the community because he can contaminate those around him. On the other hand, the histolytica form is responsible for "amoebiasis disease" which can be serious, even fatal. How and under what influences does the inoffensive form become brutally aggressive ? No definite answer has been found. Added causes, such as intestinal microbic superinfections are held to be responsible. Already in 1908, Mathis* maintains that pathogenic activity is triggered off by the rich intestinal bacterial flora found in hot countries. With the repatriation of patients, the flora is modified and the state of health often improves. A good argument in favour of this theory is the fact that amoebic dysentery has not spread in France in spite of the continuous arrival of patients who are carriers and transmitters of cysts. F. Blanc* shares this opinion and advocates treating, at the same time, amoebiasis and microbic intestinal infections. Amoebiasis is not a disease that affects the body in general : its activity is localized. Thanks to its enzymatic equipment, it produces a contact necrosis on the level of the tissues. Two characteristics of the amoeba are, firstly, its tenacity in occupying the colon, giving rise straightaway to a chronic disease with frequent recurrence and, secondly, its tendency to spread inside the organism, especially into the liver. Colonial physicians, when their appointments are changed, observe that the amoebae show a tropism for the liver more frequent in Indochina than in Africa. It is true that these observations are made at different times and in different living conditions. Nevertheless, the possibility of the existence of several strains of amoebae is envisaged and seems to be confirmed (Charmot*). There is no colonial physician who has not had to treat people coming for consultation at an acute stage of the disease : 10 to 12 slimy, bloodstained motions each day, vigorous abdominal colics and the continual feeling of the need to relieve oneself which does not result in motions. The physician himself may be a victim of the disease, sooner or later. Another variety of dysentery due to bacilli (Shigella), just as fearsome, rages in the tropics. The number of motions is even higher than in amoebiasis. Moreover, the general state of health is seriously altered by high fever and rapid dehydration. This dysentery, called bacillary, affects the same body locations with the same modes of contamination as amoebiasis. Both diseases afflict only humans and their coexistence in the same patient is frequent and forebodes serious prognosis, already noted at the beginning of the 19th Century by Brau*, Bertrand* and Grall*. - The spread of amoebiasis into the liver may be extremely precocious and, with Bordes*, he describes the pain that follows the weakening of the liver and which, from the beginning, reveals the hepatic complication, the intra-hepatic accumulation which must sometimes be evacuated. - The considerable rise in the rate of sedimentation of red blood cells is a good indication for detecting and pursuing the treatment of hepatic sectors. - He studies pharmacology and modes of action of anti-amoebic medicines as soon as they are discovered. Extra-intestinal localizations of the disease often need surgery. Following Le Corre* and Huard* in Indochina, many colonial surgeons codify and practise procedures for the drainage of amoebic abscesses in the liver, the brain and the lungs. An acute and painful form of the disease, malignant amoebiasis (extended colic necrosis) can appear in pregnant women. It is carefully studied in Dakar by Sankalé* and Carayon*. The diagnosis of amoebic dysentery is accomplished by doing research on faeces of the vegetative form (histolyca containing red blood cells). The diagnosis of extra-colic amoebiasis, in particular hepatic, is made easier today by modern methods : immunology makes it possible to affirm the existence of amoebiasis down in the tissues and medical x-rays localize intra-visceral accumulations. Amoebiasis is at first a cosmopolitan disease. It is to be observed in the whole of the French Colonial Empire with a definite predilection for Indochina. Nowadays, it is practically confined to the tropics where it remains a very common ailment. Native amoebiasis has become rarer and rarer in the West where high hygienic standards have eradicated it. In 1985, the WHO esteems the number of people infected at 480 million, that is to say, 10 % of the world population. Among them, 48 million are afflicted with amoebiasis disease and from 40 000 to 110 000 die of it. Ingested by a healthy subject together with vegetables or drinking water or just through auto-contamination (dirty hands), the cyst opens out in the digestive tract and divides itself. A subject who is a carrier of amoebae is also a breeding ground for cysts. His health is in danger and he becomes a danger to the community. For centuries, in Brazil, a decoction of ipecacuanha roots is used with success against dysentery. In 1817, the Frenchmen Pelletier and Magendie extract its active principle, Emetine. Recommended by Rogers in 1912, its remarkable efficacy revolutionizes the prognosis of the disease. From 1913, the colonial physicians Maurras* and Hervier* use it in Saigon and determine its posology. But it is not a medicine free of toxic elements and it must be administered together with strychnine, Vitamin B1 and digitalin to compensate for its depressive cardiac effect (Blanc* and Bordes*). However, it has no effect on amoebic cysts and a course of Emetine treatment must be followed by medicinal treatment with arsenicals (Stovarsol, introduced by Marchoux*, Nogué* and Léger* in 1923) and later with iodine components (Blanc*). Used for a long time against dysentery in India, the bark of a Holarrhena is studied by the British and Indians in the 1930s. In 1940, in Senegal, faced with a shortage of Emetine, the colonial chemists (Trenoux* and Tanguy*) extract Conessine from a tree of a related species, the Seoulou. Tanguy*, Robin* and Raoult* use it in Dakar (1947), Soulage* in Saigon and Alain* in Marseille. Administered orally, the medicine is efficacious and fairly well tolerated. Dehydroemetine, a synthetic product, introduced into therapeutics by F. Blanc* in 1961, replaces Emetine : this compound has the property of being six times more active than Emetine, half as toxic and of being eliminated twice as rapidly. Some time later, it is produced in the form of sugar-coated pills, which simplifies its administration. The use of metronidazole, from 1966 onwards, revolutionizes the treatment of all forms of Amoebiasis and leads gradually to the disappearance of all the other medicines. It is easily administered, well-tolerated and effective on the vegetative forms and cysts, as L.-J. André* demonstrates. This medicine is a complete amebicide. Several other derivatives are synthesized later and prove to be extremely efficacious against the parasite. PREVENTION - THE FIGHT AGAINST THE "FAECAL PERIL"
Amoebiasis remains a major endemic in the tropics. The establishment of prevention measures, as for all diseases whose transmissions have a faecal origin, is very different from that concerned with other tropical endemics. For example, Malaria, Leprosy and Sleeping Sickness need sanitary programmes : detection, vaccination, the destruction of vectors, etc... 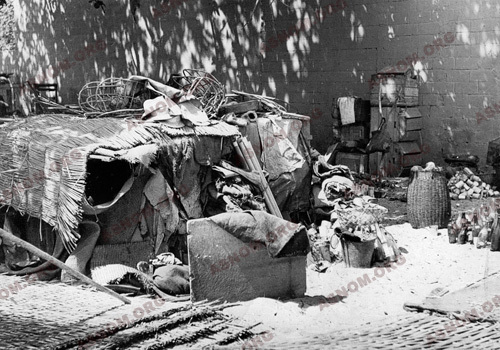 In the case of Amoebiasis, what is necessary are works of town planning and health improvement. This explains why this disease does not appear among the objectives of the services combating great endemics in Africa nor among those of the special WHO programme to combat tropical diseases, established in 1974. There is no definite prophylaxis, either chemical or by vaccination. The prevention of Amoebiasis can only be rendered effective by breaking the chain of transmission of the disease : on the one hand, by treating patients and bearers of cysts ; on the other hand, by applying the rules of general hygiene and food intake, which constitute what is essential in the fight against the "faecal peril". In this huge undertaking, the colonial physicians or chemists do not have a direct role. They can only intervene through those who perform the work of prevention, whose motivation and activities are beyond their control. - The tasks of head nurses : by examining excrements, they detect people afflicted with amoebiasis and treat them. They must pay particular attention to the patient's immediate family, teach mothers how to make the water of a creek drinkable, how to wash vegetables that are consumed raw with a solution of potassium permanganate, how to oblige children to wash their hands before meals, etc. - The tasks of schoolteachers : they make their pupils aware of the danger of dirty hands and teach them how to keep them clean ; they control the quality of the water available in school and cleanliness in school toilets and in latrines for troops in the countryside. - The tasks of rural chiefs or heads of agricultural services : they must convince villagers not to use human excrements as manure (this practice, unknown in Africa, is quite common in Asia). - The tasks of the Administration and the Public Works Department consist of constructing sewerage systems in towns and assuring a supply of drinking water in fountains, if not in houses. In Cochin China, when water conveyance is established and the Pasteur Institute controls the quality of the water, the morbidity and mortality rates decrease spectacularly. This supervision of water supplies is one of the main responsibilities of all the colonial Pasteur Institutes. In 1947, near Saigon, the occurrence of Amoebiasis in the population is reduced from 15 % to 0.005 % by generalizing the use of a controlled water supply, the washing of salads in water containing potassium permanganate and the regular scrubbing and cleaning of the cook's hands (Blanc*). At present, after the end of armed conflicts in Indochina, amoebic dysentery syndromes and their hepatic manifestations tend to be rare. It is certain that the improvement of living standards of the populations has diminished the propagation of the disease. The fundamental measures to be undertaken for the prophylaxis of diseases of faecal origin, particularly Amoebiasis, are, on the one hand, the neutralization of human excreta and the construction of a sufficient number of latrines for the community or individuals; on the other hand, a good supply of flowing and drinking water for the community. - Mathis C., Mercier L. : L'amibe de la dysenterie, Entamoeba dysentariae, Councilman et Lafleur. Bull. Inst. Pasteur. 1891,14,641-663. - Blanc F., Siguier F. : L'amibiase. Etude clinique et thérapeutique. 1 vol. 634p. L'expansion sc. franç. Edit. 1950, Paris. - Rev. Prat. : 21 septembre 1963,13,24,2861-2960. Numéro entier consacré aux Amibiases tropicales. - Sankale M. Quenum C. Agbetra M. N'Diaye : P.D.6 Les amibiases coliques malignes. Etude anatomique et clinique Méd. Trop. 1975,35,111-117. - Sankale M. : L'abcès amibiens du foie en milieu tropical. Conc. Méd. 1978,100,4365-4376. - André L.J. : Emploi du métronidazole dans le traitement des manifestations aigues de l'amibiase intestinale. Méd. Trop.1967,27,245-251. - Courbil L.J., Bouffard A. Bourdais A. : Indications chirurgicales dans les colites amibiennes nécrosantes suraigües. Chirurgie. 1981,107,488-492. 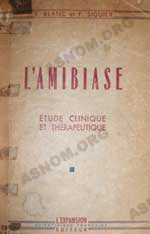 - Sankale M. : Aspects cliniques de l'amibiase humaine. Conc. Méd. 1981,103,6963-6976. - OMS : L'amibiase et la lutte anti-amibienne. Bull.Org. Mond. Santé. 1985,5,821-831.